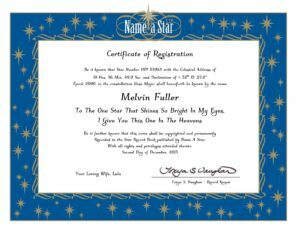 This web site is the property of Name a Star – The Original Star Naming Service – Since 1978®. Name a Star™ has created this privacy statement to demonstrate our firm commitment to privacy issues. The following discloses the information gathering and dissemination practices of Name a Star™ . At Name a Star™, we are very committed to your privacy, so here is our privacy promise to you. Name a Star™ will never sell, exchange, or release to a third party any of your individual personal information without your express permission. If you visit our web site: When you visit our web site, your web browser transmits to our server(s) some basic information needed to complete your request: your IP address, the page you request, any parameters for the request, the browser you are using (including version and operating system,) and the page you are coming from. This information is used to serve your request for a web page, and some of it is then kept in our web server logs. If you register to obtain a Name a Star™ user ID: When you register with Name a Star™ to obtain a user ID and password, in addition to the information we gather from all web site visitors we also ask you to provide us with your name, your email address, your chosen user ID and password, and some basic demographic information such as you postal/zip code and your country. We keep all this information in an encrypted form in our systems. If you purchase products or services from us: We collect from you identification information such as your name, your company, address, telephone number, fax number, and email address. We also keep a record of the products or services you ordered from us. When you send us your payment we may also collect additional information such as the date of payment, your method of payment and your account number or credit card number and expiration date. All credit card information is collected through a secure server. Name a Star does not store credit card information. If you submit user comments: We will collect the information that you write in the comment, the date and time that you wrote your comment, and associate that information with your user ID. If you submit any other information over the web site: We receive and record the information you submit. If you email us: In addition to the contents of your message, we collect your email address and the list of email servers that the message traversed on its way to us. If you fax us: In addition to the contents of your message, we collect your fax header information and the number you called from via Caller ID. If you write to us by mail: In addition to the contents of your message, we collect your return address and postmark date. If you call us: In addition to the contents of your message, we collect the telephone number you are calling from via Caller ID. We analyze our web logs for activity, trends, most frequently requested pages, paths through the web site, etc. This enables us to understand how our users use our web site, and how we can improve to make it even easier to use. In our analysis we look at aggregate information, as our logs do not have any personal identifying information. We analyze data from Google’s Interest-based advertising or 3rd-party audience data (such as age, gender, and interests) with Google Analytics. We look at aggregate information. Google does not supply us with personal identifying information. We may have a need to contact you for clarification on some submission you made, to reply to a message you sent us, to inform you of an update made to your listing, or to solicit your assistance with some issue. We will use personal identifying information we have about you in our attempt to contact you. If you submit a comment about a business, service, or facility listed on Name a Star™, and we publish your comment on our web site, we will publish also your name and the date you made your comment. Upon request by the business affected by your comment, who may want to follow up with you regarding your comment, we may also release to the affected business personally identifying information such as your email address or home base. If you want your name withheld from any specific comment, please contact us by email . Be aware that after we remove your name the comment will read as coming from an anonymous person, and we will after that honor any request by anyone to remove that comment. Occasionally, an Name a Star™ user or other interested party may desire to contact another Name a Star™ user. This happens most often as a result of a comment posted by a registered user. We will follow your instructions about release of your name and email address to any such third party. When you register with us, or when you subsequently update your profile with us, you are given three options for protection of your email address: do not share with anybody, share only with other registered users, or share with anyone. We will follow your instructions when dealing with requests by third parties. From time to time, we may share with third parties aggregate information, such as how many visitors we get per day, or how many of our registered users are pilots. Such information will not contain any personal identifying information. From time to time, we make available to third parties information in bulk. We will never release email addresses as part of any bulk data that we may release to a third party. We will never release personal identifying information about our registered users as part of any bulk data that that we may release to any third party. We will disclose personal identifying information we may have in response to subpoenas, court orders, or legal process, or to establish or exercise our legal rights or defend against legal claims. Name a Star™ partners with third parties to provide some services over the web. We do not disclose your personal identifying information to these third parties. However, they may collect personal identifying information themselves. If you are interested in the privacy policies of our partners or affiliates, please visit their web sites. We do not exchange cookie information with any third party. If you do not want to accept cookies from Name a Star™ or other sites, your browser software should allow you set that preference. In Microsoft Internet Explorer look under Internet Options, in Netscape look under Preferences.